UTrack Lite is a productivity app. by TenPearls that allows you to keep track of your to-do lists in an easy, consolidated way. Are you one of those people who have post-its all over the house reminding you to do things? Would you be lost without your lists? I am a post-it queen myself, and this app. is going to make my life a lot easier. There is a track board with four columns on it where you can create notes for yourself. The columns (from left to right) are: To Do, In Progress, Verify, and Done. You can create virtual post-its for yourself in Yellow, Blue, Green, or Pink. Once a new note is created, it automatically appears in the To Do column. 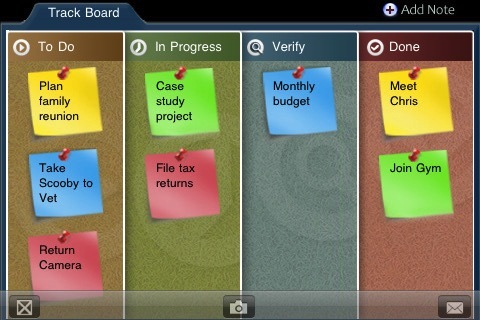 As you attack each one of your tasks, you can move your virtual notes with your finger into the appropriate columns. You can also double tap on any of the notes to open the note back up for editing or deletion. The look of the app. is cute and colorful- the track board looks like a bulletin board, and each column is a different color. When you create notes, they show up with a little red pushpin in them, which I find adorable for some reason. It’s basically like carrying around a huge bulletin board in your pocket- but this way, you can always have your task list with you, and you don’t have to spend your hard-earned money on the board or post-its! Also, your kitchen/bedroom/etc. will feel much more Zen without all those tasks taunting you from the wall. You can also take a photo of your track board or email it to someone. This could come in handy for creating a honey-do list for a significant other, or reminding kids to do their hw or clean up their room. You could also take a screen shot each day if you want to track your progress over time. If you want to start a fresh list and clear your track board, you can do that as well. My only (very minor) criticism of UTrack Lite is the “Verify” column. For me personally, the To Do, In Progress, and Done columns are sufficient- but who knows, maybe there are people out there who feel strongly about the verification of their tasks. I guess the only other problem someone might have with it is that it’s perhaps too simple- if you need your productivity tracking app. to be more complicated, then this isn’t the one for you. UTrack Lite is a straightforward way to manage your list and post-it note chaos. Oh, and did I mention it’s FREE? Why not give it a try? AppSafari review of UTrack Lite was written by Tyne Kennedy on April 2nd, 2010 and categorized under App Store, Notes. Page viewed 3832 times, 2 so far today. Need help on using these apps? Please read the Help Page.